Knock, knock. Who’s there? Wood. Wood who? Woodn’t you like to know! 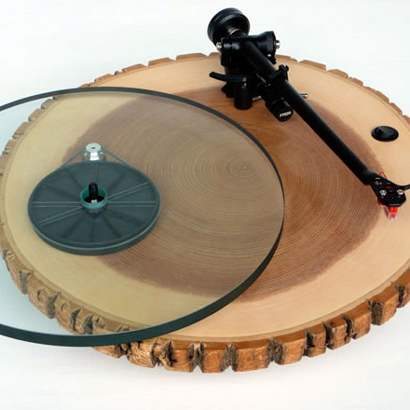 Here is your perfect turntable for the chalet! Barky is a limited-production (10-15 per year on average), high-quality turntable made with a solid ash round, quality Rega parts kit, 24 Volt Power Supply, heavy glass platter and Rega RB303 tonearm. It includes a pre-mounted Rega Elys2 Cartridge (not shown), adjustable solid brass spike legs, and is finished with hand-rubbed polyurethane and paste wax. Each Barky is somewhat unique. Barky has been featured in Metropolitan Home, Zink, California Home and Design, Velvet (Italy), Daily Mail (UK) and in dozens of online design mags. and blogs. Barky is available in either 115V or 230V versions (please specify when ordering). Barky is also compatible with the Rega TTPSU external power supply which is available as an extra, and which allows for push-button speed changes. 24HOV #6 - THANK YOU!